Porth Beach is a families and couples only site. No bookings will be accepted from all male, all female, or uneven mixed groups of friends. We do not accept singles. All prices are inclusive of VAT at 20%. If the VAT rate changes, the actual amount due will be determined by the rate prevailing on the day your money is received. Information supplied will be stored on computer for the purpose of future distribution to you of our advertising material and under no circumstances will be passed on to a third party. For the Data Protection Act 1984 the acceptance of a booking signifies assent to this. Bookings will only be classed as “confirmed” on receipt of your deposit and signed pitching agreement. Any bookings that have been given a specific “hold until date” but no deposit received, will be cleared at 12 noon on said “hold until date”. Unfortunately no exceptions can be made due to increased demand. Changes made to an existing booking will incur a £5 administration charge. Unruly behaviour and malicious damage will not be tolerated. The parties involved will be asked to leave immediately with no reimbursement. The company reserves the right to terminate any booking. Holidays booked in advance must be paid for in full at least 40 days before the date of arrival. If not we reserve the right to re-let the unit without notice or charge a late payment fee. Holidays booked within 40 days of the arrival date must be paid for in full at time of booking. Caravans are available from 4pm on date of arrival until 10am on date of departure. Upon arrival a £50 key deposit is required which will be returned on date of departure after your caravan has been vacated and checked to ensure no washing up has been left and that the caravan is left in a satisfactory condition. No pets of any kind are allowed in the caravans – nor can they be kept in cars adjoining the caravans – anyone found doing so will be asked to leave. Unless otherwise notified of changes in arrival date or time your caravan will be held for you until noon the following day, at which time it is available for re-let. Touring pitches are available from 12 noon on date of arrival until 10am on date of departure. Unless notified of changes in arrival date or time, your pitch will be held for you until noon the following day, at which time it is available for re-let. Site fees are charged on a per pitch basis not per person. No groundsheets allowed unless of the continental “breathable” type for caravan awnings. maintaining a friendly and safe environment, you will be asked upon booking to state the breed of your dog(s). The Cancellation Cover premium is automatically included in your deposit. We strongly advise you to take the cancellation cover as no refunds are given without it. For this small premium Porth Beach Tourist Park will refund any monies paid excluding the cancellation cover charge and booking fees, provided we receive written confirmation of cancellation of the entire party at least 2 weeks before the commencement of your holiday. 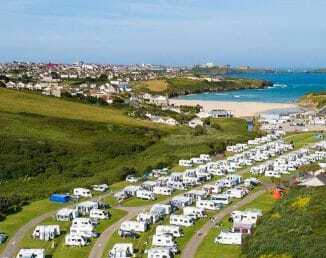 Porth Beach Tourist Park will only refund if cancellation is due to any of the following – serious illness or redundancy to any of the booked party. Death of an immediate family member (specifically spouse/partner, parents, children or a brother/sister – this cover does not extend to any other family member). Please note that the claim must be in writing and supported by the relevant documents (doctors note, P45, death certificate.) We do not reimburse the costs of securing these documents. If you have your own holiday insurance and do not require Porth Beach Tourist Park’s cancellation scheme we will require you to put this in writing to us so we can remove the premium. This must be received within two weeks of the booking being made. No refunds will be made on bookings without the cancellation scheme. Please note refunds cannot be given after arrival if for any reason you should leave early. If required, linen is available at £6 per set. Please indicate upon booking how many sets you wish to order. We have Wi-Fi available on site for our customers to purchase at reception at a chargeable rate. Specific Pitches Pitches/caravans are allocated at random. If you wish to secure a specific pitch/caravan there is a one off charge of £10 per pitch/unit. This also applies if you require two or more pitches/caravans next to one another. Please have your units full measurements ready to discuss pitch sizes with the receptionist upon booking. Due to fire regulations you are required to pitch on the correct size pitch for your unit in a certain set area, so that there is a specific amount of space between each pitch. When booking online or over the phone you are require to provide us with the correct measurements of your whole unit including any ropes. Please note: If upon arrival your unit is larger than confirmed, you will be moved to a larger pitch and required to pay any difference in price. During busy periods we may not have anything larger available to accommodate your unit. In this instance refunds will not be given due to it being your responsibility to confirm your units exact measurements.